Syntagma (constitution in Greek) is the square in front of the Parliament (formerly the King's Palace, built between 1836 and 1840 by King Otto and financed by his father Ludwig I of Bavaria) and it is considered the main square of Athens. The square is a central point to access all the major attractions of Athens, particularly 'museum mile' along Vassilissis Sophias Avenue which runs from Syntagma Square. 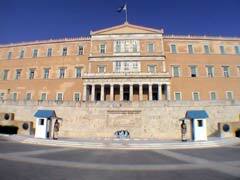 Here most of Athens museums are clustered, including the Benaki Museum, Museum of Cycladic Art and the Byzantine Museum. At the west (bottom) part of Syntagma square is the beggining of Ermou street (the main shopping district of Athens) that leads to Monastiraki square.